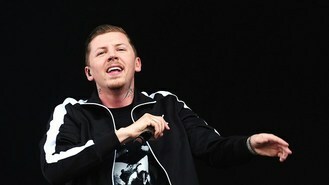 The rap star, whose real name is Stephen Manderson, was due to play 12 dates in November but said recuperating from a recent car accident had not left him with time to work on the record. He said: " Firstly, I can't apologise enough for postponing the tour, I'm as excited to see you all as I hope you are me. "Everything was on schedule and then I was unfortunate enough to end up sandwiched between two cars, leaving my health and album/touring schedule in absolute jeopardy. "I want to make the best possible album I can for you all and I want you to have heard the new music so we can all enjoy the shows how they're meant to be enjoyed. "I could have rushed an album for the sake of making the tour but as I hope you all know I'm in this for the music and am not willing to let it suffer due to a date in the diary." The star, who recently married Made In Chelsea's Millie Mackintosh, promised fans there would be "some b its and bobs in the meantime to bridge the gap". The new tour, which includes gigs in Glasgow, Derby, Bristol and Liverpool, will start in May.